Come enjoy this million dollar view of Wallowa Lake and the Eagle Cap Mountains! This is a large home with an open floor plan with windows that provide nice views. It is across the street from the county park and boat launch at the north end of Wallowa Lake where there is also an area where the family can swim in the stunning water or take the boat out and fish or waterski. 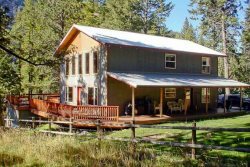 This grand vacation home is located at the north end of Wallowa Lake on a large grass covered piece of property where you can sit out on the lawn and enjoy the mountains and lake during the day and the incredible stars at night! It has an unbeatable view of the Eagle Cap mountains and Wallowa Lake. It is a perfect place for a large family vacation. UPDATED TO INCLUDE NEW FLOORING AND NEW KITCHEN! You won't want to miss out on staying in this incredible vacation home!